A Hard Hitter.- Developed for infantry support during WWII, the Assault Tank IV married the trusty Pz.Kpfw.IV chassis with a simple fighting compartment featuring 100mm of front and 50mm of side armor, plus a high-powered 15cm gun that could defeat 160mm of 30-degree armor from 5km. Its variants can largely be grouped into early, mid and late production types, the latter of which was most numerous with 160 examples manufactured between May 1944 and March 1945. Feedback from crews of earlier Brummbärs had led to new a fighting compartment design and cupola, plus partial use of steel road wheels. Brummbärs were assigned to their own dedicated Assault Tank Battalions and fought on the Eastern Front and in Italy as the war drew to its conclusion. This is a 1/35 scale plastic model assembly kit. Length: 168mm, width: 94mm. ★The kit gives a highly accurate recreation of the Brummbär with its stubby 15cm gun. ★Gun barrel offers elevation and depression. Traverse motion is in tandem with sight and cover. ★Five Schürzen plates are attached and can be removed individually, for a variety of looks. ★Parts are included to recreate rubber-rimmed and all-steel road wheels, used in different combinations depending upon chose marking option. ★Comes with a commander torso figure for the cupola, and a full-body crew figure. ★Decals for two marking options are included. Movable 15cm gun offers traverse coordinated with sight and cover motion, plus elevation and depression. The model is chock full of detail, with areas such as the engine compartment at the rear sure to grab your attention. A dedicated Zimmerit coating sticker sheet (Item 12673, separately sold) can add further realism to your model. Fighting for the Enemy.- Developed from 1939, the AHN 3.5ton truck had had prototypes produced, but before it could be manufactured France fell in June 1940. The conquering German forces saw potential in the design, however, and continued its development, eventually producing it for their own use. Lightweight and enduring, the AHN was well-suited to mass-production, and was easily recognizable thanks to its cabover design. It was powered by a 75hp 6-cylinder engine. Some 4,000 were manufactured between 1941 and 1944, serving on the Eastern Front and Italy, transporting personnel and supplies, even towing artillery. About the 3.7cm Flak 37 AA Gun.- The 3.7cm anti-aircraft gun was a mainstay for German WWII troops. Firing 6-round clips at a maximum rate of 160 rounds per minute, it was deployed in Luftwaffe anti-aircraft units, used as a counter to incoming low-altitude Allied aircraft. This is a 1/35 scale plastic model assembly kit recreating the AHN 3.5ton truck and 3.7cm Flak 37 AA gun. ★AHN truck model dimensions: 190mm length, 70mm width. The bonnet-less cabover body is recreated with accuracy. ★Features depictions of the inline-6 engine, and the suspension. ★Synthetic rubber tires feature realistic tread patterns. ★Comes with 4 realistic figures including a driver in action pose. ★2 marking options are included, recreating vehicles in Italy and on the Eastern Front. ★A wealth of accessories includes oil drums, 2 jerry can types, stowage boxes and more. They can be positioned on the truck bed. ★AA gun can be depicted being towed or in firing position. ★Truck parts are a product of ICM. Give your model that extra layer of detail by using the multitude of accessories in the kit. Gun barrel gives elevation and traverse movement, and can also be slid back and forward. Accomplished Tank Hunter.- In Summer 1942, the order was given for a heavy tank destroyer based upon the Panther chassis to be developed. The vehicle it spawned was the Jagdpanther, regarded by many as one of the best tracked weapons systems of WWII. With a powerful L/71 8.8cm gun, boxy superstructure protected by sloped armor (front: 80mm thick, sides: 50mm thick), and 700hp Maybach HL230P30 engine that provided speeds up to 55km/h, it had an excellent balance of power, survivability, and mobility. Assigned to units from June 1944, it first saw action with the 654th Heavy Anti-Tank Battalion in Normandy, and also went on to serve in the Ardennes Offensive as well as on the Eastern Front. A touch of superb detail is provided by the turned aluminum gun barrel, with excellent realism and no need to take care of awkward seams. This is a 1/16 scale plastic model assembly kit recreating a late version Jagdpanther tank destroyer. ★Length: 605mm, width: 207mm, height: 167mm. ★The Jagdpanther form is depicted with aplomb, including the sloped fighting compartment and massive 8.8cm main gun. ★Features a tough duralumin chassis. ★Metal parts recreate drive sprockets, idler wheels, suspension parts and more. ★Includes durable pre-assembled wide resin tracks with metal pins. ★The 8.8cm gun features an aluminum barrel for superb realism. ★Photo-etched parts are included for a superbly detailed finish. ★Comes with 3 marking options recreating German Army vehicles. A host of metal parts includes the drive sprockets, suspension arms, torsion bars and more, ensuring your model has a durable finish. A choice of muffler parts (standard or low visibility) is included in the kit, each belonging to its respective marking option. Numerous parts are included to depict a range of accessories such as tow cables, wire reel and different tools, giving an extra level of realism. This is a 1/48 scale plastic model assembly kit recreating the Sturmtiger. Length: 133mm, width: 78mm. ★The powerful form of the vehicle is accurately captured using an intuitive parts breakdown. ★Rifling detail has been molded into the barrel of the stubby main gun. ★Fighting compartment armor plate parts breakdown was based upon the weld lines of the actual vehicle. ★Main gun offers traverse, elevation and depression. ★Assembly-type tracks feature 1-piece straight sections. ★Comes with a full body figure depicting a soldier standing outside the vehicle. ★Weights are included for installation in the hull, giving a realistically heavy feel. Also going on sale separately is Item 12672, recreating Zimmerit anti magnetic mine surfaces. Realistic assembly type depictions of the wide tracks utilize one-piece straight sections. A 1/48 Heavyweight.- With a powerful 8.8cm gun capable of taking out Russian T-34s and KV-1s from range, plus armor up to 200mm thick, the Elefant heavy tank destroyer was a formidable prospect. Originally named the Ferdinand, 90 were produced by May 1943 and in their first combat action in the Battle of Kursk that July, they are said to have accounted for over 500 Russian tanks. However, after Kursk they were withdrawn for an overhaul and came back in February 1944 re-named the Elefant. They were active in Italy and on the Eastern Front, even being thrown in to the defense of Berlin as WWII drew to a close in Europe. This is a 1/48 scale plastic model assembly kit of the Elefant heavy tank destroyer. Length: 172mm, width: 71mm. ★The boxy form with long 8.8cm gun is recreated with aplomb. ★Fighting compartment parts breakdown is based upon weld joints on the actual AFV. ★Assembly-type tracks have single-piece straight sections. ★Commander torso figure and 1 marking option are included in the kit. ★Hull weights give the model a realistically heavy feel. Use simultaneously sold Item 12671 to recreate anti-magnetic mine Zimmerit coating. Tracks are assembly type with single-piece straight sections. 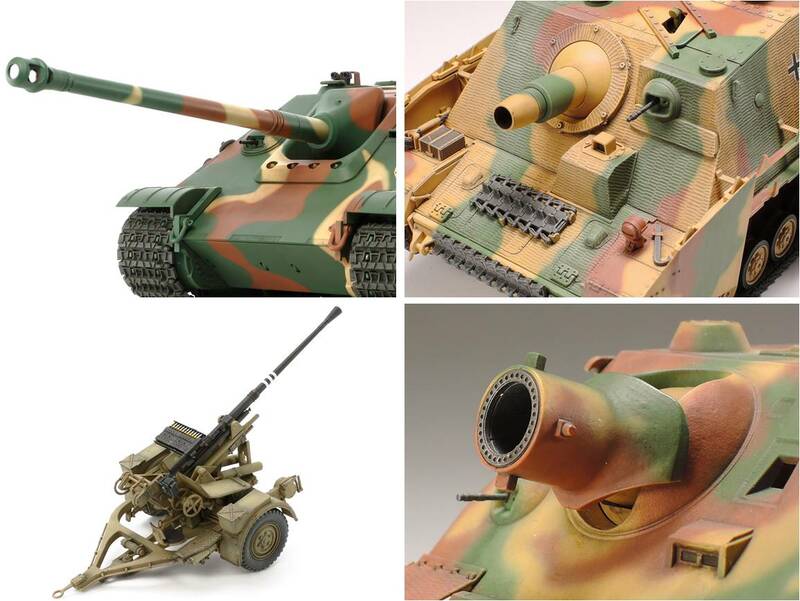 This accurate model recreates the Elefant in stunning 1/48 scale. The fighting compartment parts breakdown is based on the actual vehicle's weld lines. Get Mechanized!.- Developed as a part of early German moves toward mechanization of their reconaissance units from the late 1920s onwards, the Sd.Kfz.231 was a heavy armored car that used the chassis of a 6-wheeled civilian truck as a base. Given sloped armor and armed with a 20mm main gun and 7.92 machine gun, it garnered a top speed of 62-70km/h from a 60-70hp gasoline engine. Driver seats were installed front and rear for quick mobility. Together with its frame aerial-equipped Sd.Kfz.232 cousin, around 130 were manufactured, and took part in fighting in Poland and France during the initial phases of WWII. Some of the Sd.Kfz.231s sent to France were seen with additional smoke dischargers fitted to the front of the body. The sloped armor of the Sd.Kfz.231 is captured with aplomb. This is a 1/35 scale plastic model assembly kit of the German 6-Wheeled Heavy Armored Car Sd.Kfz.231. Length: 175mm, width: 60mm. ★It takes the classic Italeri kit of the Sd.Kfz.232, removes the frame aerial, and includes new and re-tooled parts to recreate the Sd.Kfz.231 with great realism. ★Comes with a high-quality turned aluminum gun barrel. ★New separate parts are used to recreate the turret-top anti-aircraft gun base and front smoke dischargers. ★2 fine weld lines have been added to the center section of the body. ★Now with upgraded and more secure fit for parts such as fender-top equipment. ★Offers a realistic depiction of the vehicle suspension, complete with steerable front wheels. ★Includes a commander figure with choice of headwear. ★The 2 included marking options recreate vehicles in Germany and France. Includes machine gun base parts and aluminum main gun barrel. New parts recreate vehicle front smoke dischargers. A Versatile Workhorse.- Mobility was a key to all WWII militaries, and one way that Nazi German forces tried to secure it was through the use of semi track vehicles. The Sd.kfz.7 was one of the more famous examples, and found numerous applications in the war effort, from the transportation of personnel and supplies, to towing anti-aircraft pieces such as 20mm and 37mm guns, and even the rescue of stricken armor. Perhaps it is most noted, however, for its use in towing the famed 8.8cm anti-tank gun that German forces used to such great effect. This is a 1/35 scale plastic model assembly kit recreating the Sd.kfz.7 semi track. Length: 200mm. ★The sturdy form of the vehicle is recreated with accuracy, including the complex wheel placement. Front wheels are steerable. ★The driver's position features details such as instrumentation and pedals for an authentic look. ★Choose whether to assemble the kit with canvas hood up or down. ★Comes with no less than 8 figures, depicted in a variety of relaxed poses. Restored German Pak 40 in Images! Impressive Work Made by a Spanish Reenactment Group!